I was brought to the attention of the debate around stripy nano-particles fairly recently. Since I have been working with alkanethiol monolayers on Au(111) for a number of years, naturally I became interested in the arguments put forward by both sides. 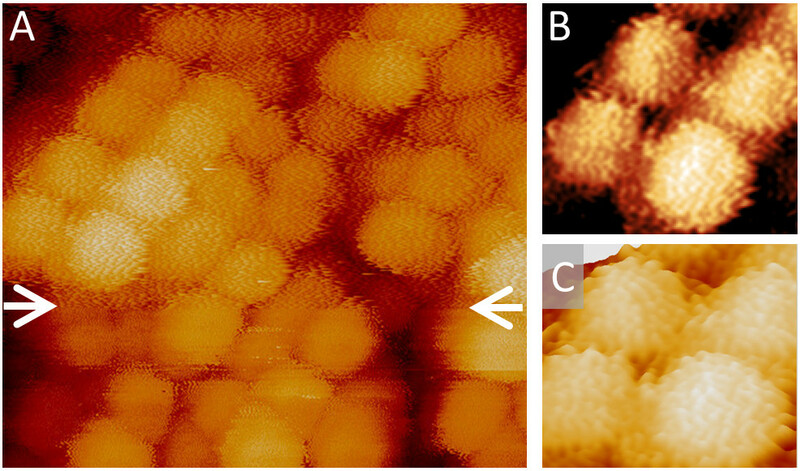 Incidentally, I imaged thiol-passivated gold nanoparticles in 1999. I have to say that the quality of our images was poor (A few images can be found on PCCP Vol. 4, 2002), certainly not better than those of Stellacci. The poor quality of the images was partly due to the equipment that we used, being noisier that we would have liked; and partly due to the fact that STM does not cope well with non-flat surfaces. While the debate at the moment focuses on whether stripes have been observed or not on gold nano-particles, I would like to address another relevant issue here first, are we expected to see stripes at all? The answer is yes, if the nanoparticle presents a (111) facet to the STM tip. The figure (Surf. Sci. 2011, Vol. 605, 1016) below shows an STM image from an octanethiol covered Au(111) surface. In this image you can see a dense phase and a less dense “striped phase”. Stripes within alkanethiol SAMs on Au(111) corresponding to ≤ 80% of saturation coverage are frequently observed with single component thiols. Also in the image, there are three islands. These islands are formed by post-deposition of Au onto the SAM. The Au atoms dive through the SAM and form one atomic layer tall islands. So the newly formed Au islands are “inserted” between the initial gold substrate and the SAM. If we call these islands “nano-particles”, there you are, we have striped nano-particles. The formation of stripes is always linked to a less than saturation coverage. Under saturation coverage, the Au islands are capped by a layer of “close-packed” molecules. The nanoparticles used by Stellacci are not single layer gold islands, they are more 3-D like. If you deposit such nano-particles onto a gold substrate, they may become flatted over time due to atomic diffusion. If the particles assume a plate-like structure, and at the same time allowing some thiolate to migrate from the particle to the flat Au substrate, then stripes may appear on top of the plate. However, the stripes reported by Stellacci seem to come from a different origin: phase separation of hydrophilic thiol from hydrophobic thiol, for example. It is my personal view that phase separation would occur so each facet is covered by a single type of thiol because the particle is so small. Under non-equilibrium conditions, there might be some random mixing. Along the stripes shown in the above figure, the distance between the dots is 0.5 nm which is also the distance reported by Stellacci. From the STM images of Stellacci and colleagues, one really have great difficulty in seeing any features of stripes. 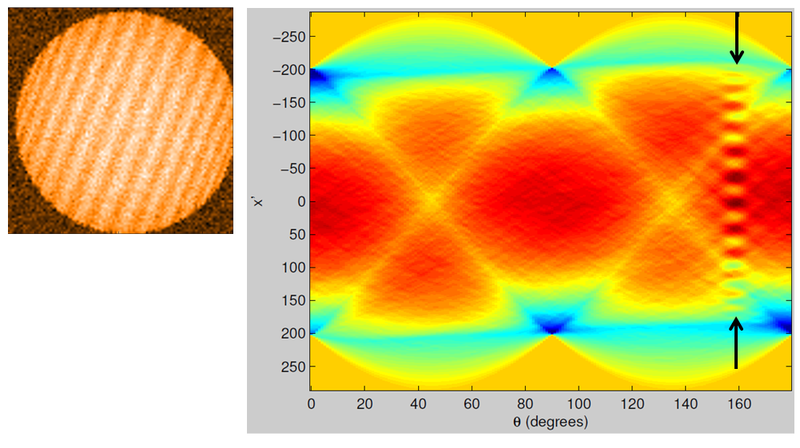 If you examine the STM images in the figure above, you can see the stripy feature are not very regular and between rows there are disordered molecules. Nevertheless, the observation of stripes in this case is beyond any doubt, and there is no need to perform power spectrum analysis. I am not trying to criticize anybody here, but in their recent Langmuir paper, Stellacci et al included an STM image of thiol covered flat Au surface (Fig. 4). Even for a flat sample, their image showed no molecular resolution. This makes me worried. It is understandable that Stellacci is eager to show some new results to make his initial observation credible. I think he needs to produce better STM images. At this point, I would like to say that the theoretical modeling around the stripy particles is immature. The long-standing view that alkanethiol SAMs consist of thiolate (-SR) directly attached to a Au surface via the hollow, bridge or bridge/hollow site is on the way out. Thiloalte are paired on the surface in the form of Au-adatom-dithiolate (RS-Au-SR). This linkage/ paring of the thiolate has an important influence on the structure of the SAMs. Update (11/06/2013): the link to the raw data on Francesco Stellacci does not work anymore; here is a mirror of the files that were released last month. It is to Francesco Stellacci (FS)’s credit that he has now uploaded the data I requested some time ago. I appreciate that this will have been a time-consuming task – I sometimes struggle to find files I saved last week, let alone locate data from almost a decade ago! It’s just a shame that the provision of the data necessitated the involvement of the journal editors (and possibly required prompting from other sources). It is also worth noting that, over the last week, FS has been very helpful in providing timely responses to my questions regarding the precise relationship of the data files in the archive to the figures published in the papers. Unfortunately, the data in the archive leave an awful lot to be desired. 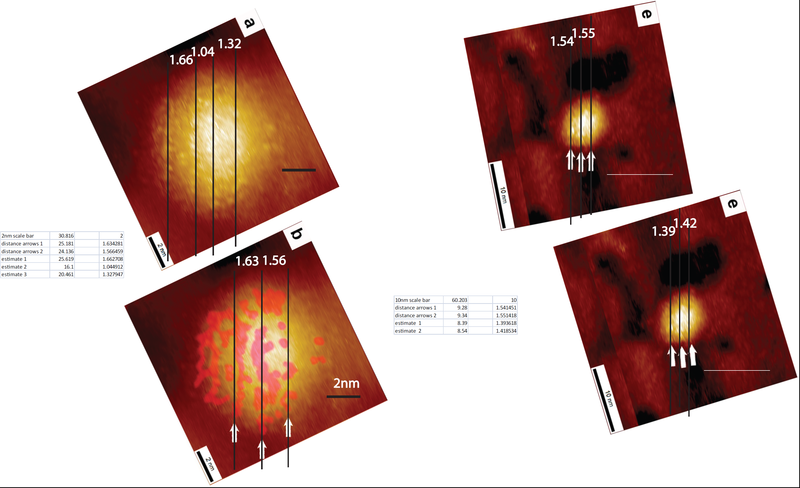 In the near future, we will write up a detailed analysis of the data in the archive, combining it with scanning probe data of nanoparticles we have acquired, to show that the conclusions reached by FS et al. on the basis of their STM data, and associated analyses, do not stand up to scrutiny. Like Raphaël, I do not agree with FS that the only appropriate forum for scientific debate is the primary literature. (I’ve written at length I’ve rambled on in my usual loquacious style recently about the importance of embedding ‘Web 2.0’ debate within the literature). Nonetheless, given, for one, the extent to which the stripy nanoparticle papers have been cited, there is clearly significant scope in the primary literature for examining the reliability of FS’ experimental methodology and data analysis. For now, I would simply like to highlight a number of the most important problems with the data in the archive. The problems are multi-faceted and arise from a combination of: (i) feedback loop artifacts; (ii) image analysis based around exceptionally low pixel densities (and interpolation, applied apparently unknowingly, to achieve higher pixel densities); (iii) a highly selective choice/sampling of features for analysis in the STM images; and (iv) experimental uncertainties/error bars which are dramatically underestimated. Much more information on the simulations will be provided in due course in the paper I mentioned above but I am sure that Julian will be more than happy to address questions in the comments section below. 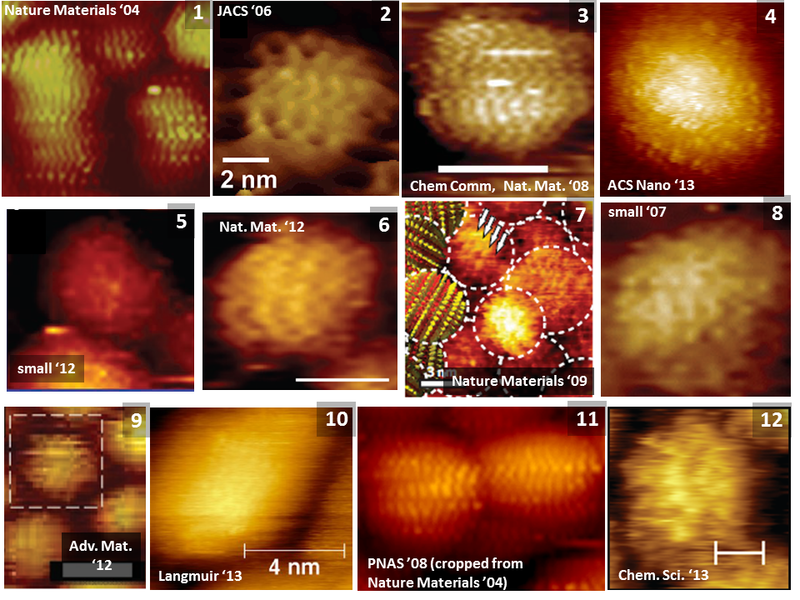 Just in case anyone might think that generating stripes in a simulated STM doesn’t quite address the observation of stripes in an ‘ex silico’ environment, we have, of course, produced our own experimental images of stripy nanoparticles. In (A) the feedback loop gain is increased dramatically at the scan line highlighted by the arrows. Stripes then appear in the upper 2/3 of the image. A low pass filter – which is, in essence, equivalent to an interpolation because it washes out high spatial frequencies – is then applied to a zoom of the image (shown in B), followed by a 3D rendering (C). The similarity with the Nature Materials figures above is striking. The key aspect of the image above is that the nanoparticles do not have a ligand shell. These are the traditional citrate-stabilised colloidal Au nanoparticles known widely in the nanoscience community (and beyond). They were deposited onto a Au-on-mica sample from water. The stripes arise from feedback loop ringing. The image above is an uninterpolated digital zoom of one of the images from FS’ archive (yingotmpa2to1011706.006; 196 x 196 nm2; 512 x 512 pixels). 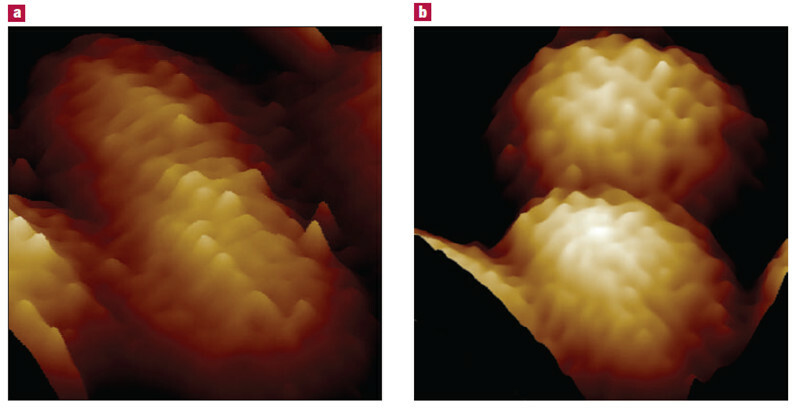 Images of this type were used to measure the “periodicity” of ripples in nanoparticles for the statistical analyses described in Jackson et al. JACS 2006 and Hu et al. J. SPM 2009. Quite how one reliably measures a periodicity/ripple spacing for the image above (and all the others like it) is, I’m afraid to say, entirely beyond me. 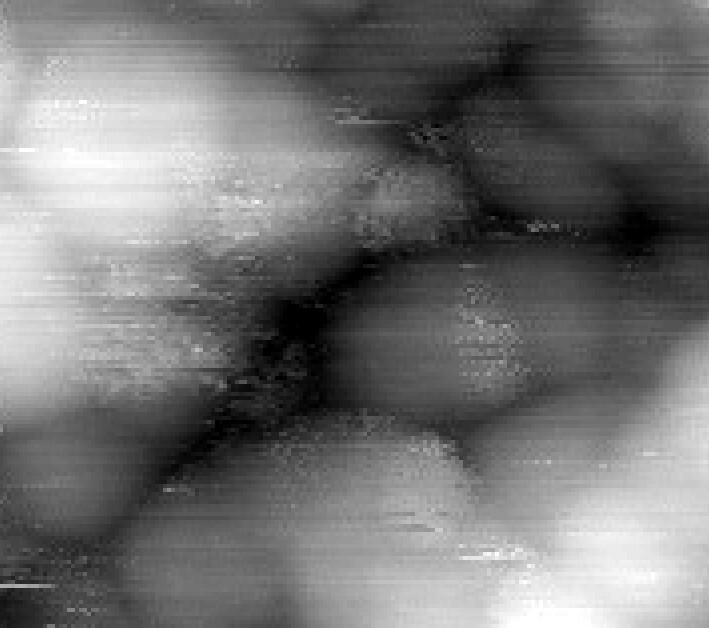 I’ve noted previously that taking very low resolution STM scans (pixel size = 0.38 nm for the image above) which are analysed via heavily interpolated digital zooms is not, let’s say, the norm in the scanning probe microscopy community. There’s a very good reason for this – why would we be satisfied with low resolution images, where the pixel size is comparable to the features of interest, when we can simply reduce the scan area, and/or increase the pixel density, and “up” the effective resolution? It is not good experimental practice, to put it mildly, to set the imaging conditions so that the size of a pixel is of the same order as the scale of the features in which you’re interested. This is a bad enough problem for images where the ripple spacing is proposed to be of order 0. 7 nm (i.e. ~ 2 pixels), as for the image above. In Jackson et al., JACS 2006, however, it is claimed that the spacing between head groups for homoligand particles is also measured and is stated to be 0.5 nm. (Unfortunately, these data are not included in the archive). If this 0.5 nm measurement was reached on the basis of a similar type of imaging approach to that above, then there’s a fundamental problem (even if the image wasn’t generated due to feedback loop artifacts). The Nyquist-Shannon sampling theorem tells us that in order to measure the period of a wave without aliasing artefacts, our sampling frequency must be at least twice that of the highest frequency component. In other words, to measure something with a period of 0.5 nm, we should have, as an absolute maximum, a pixel size of 0.25 nm. I have asked FS whether the same imaging conditions (i.e. 196 nm x 196 nm, 512 x 512 pixel) were also used for the homoligand particles. I cannot tell from the archive because the data are not there. (To be fair to FS, I did not previously ask him to provide these particular data). There are now at least a couple of dozen comments on the THE article itself. If only there were some centralised system for pulling all the arguments together and perhaps tying them to the original papers from Stellacci and from Lévy. Perhaps we will one day see such a development in web 3.0. Meanwhile, we still don’t know for sure whether those gold nanoparticles are stripy or not! In the absence of web 3.0, here is an attempt at providing a current picture of the controversy, focusing on the scientific arguments. Ethical issues such as data re-use and refusal to provide raw data are covered elsewhere. A number of technical questions have been discussed not just at Times Higher Education (25 comments) but also here at rapha-z-lab (over 100 comments), on the blog of Doug Natelson (23 comments) and in a few other places. One notable fact is the very unfortunate refusal of Francesco Stellacci and his co-authors to engage in the online discussion (with the exception of one comment by Sharon Glotzer on the article at Chemistry World). This can be contrasted with the way Phil Baran engaged with Blog Syn assessment of one of its papers as ‘difficult to reproduce‘ ; that latter case nicely demonstrates how post publication peer review combined with engagement from the criticized authors can lead to better science. Stuart Cantrill puts it succintly (referring not to this blog but to Blog Syn: “ENGAGE (and do it nicely). This is not a witch hunt, it’s for the good of science.”). The primary evidence for the existence of stripes is STM. In Stripy Nanoparticles Revisited (open access), we argue that the observed stripes are a scanning artefact rather than a feature of the particles. We base our conclusion on several argument: 1) a simple geometric consideration about projection from a sphere (the particle) to 2D (the image), 2) the direction of the stripes (always perpendicular to scanning direction), 3) the unlikely correlation between particles (see this video to understand the problem), and Fast Fourier Transform analysis. Stellacci and Yu response was published in Small at the same time as our article. After the publications, Predrag Djuranovic contacted me. He had already demonstrated that the stripes were an artefact several years ago. 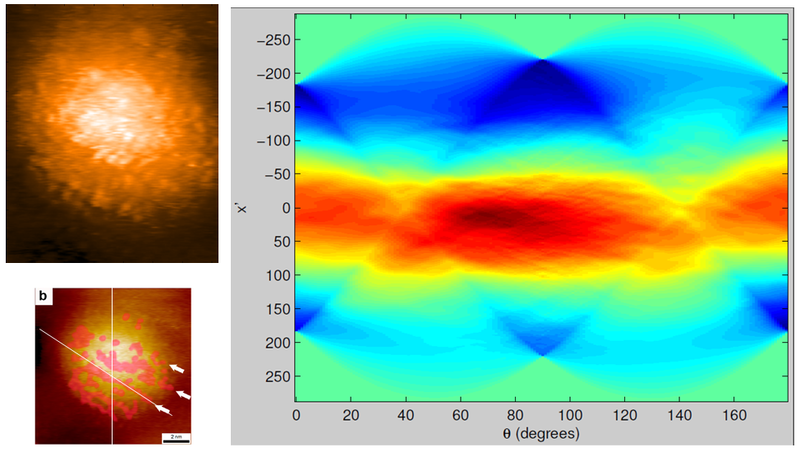 He published on my blog results which demonstrate that the stripes could be obtained in the absence of nanoparticles and Matlab simulations which show how the STM feedback mechanisms generate those patterns. Predrag was a graduate student in Stellacci’s group at MIT in 2005 when he generated these data… but they had not been published or communicated outside of MIT. Philippe Moriarty, Professor of Physics at Nottingham and leading STM expert, confirmed our interpretation of the stripes as a scanning artefact, and, discussed the response of Stellacci and Yu, showing that the ‘stripes’ presented in the new images are ‘a fortuituous alignment of random noise‘. It is unfortunate that SPMer and the above STM expert chose to remain anonymous (Rich Apodaca’s thoughts on the choice of anonymous science blogging here). Good work. The first time I saw those images, I was very very doubtful about them. I think it would be very easy to produce such images, by having some periodic noise in a scanning image of “normal” nanoparticles. 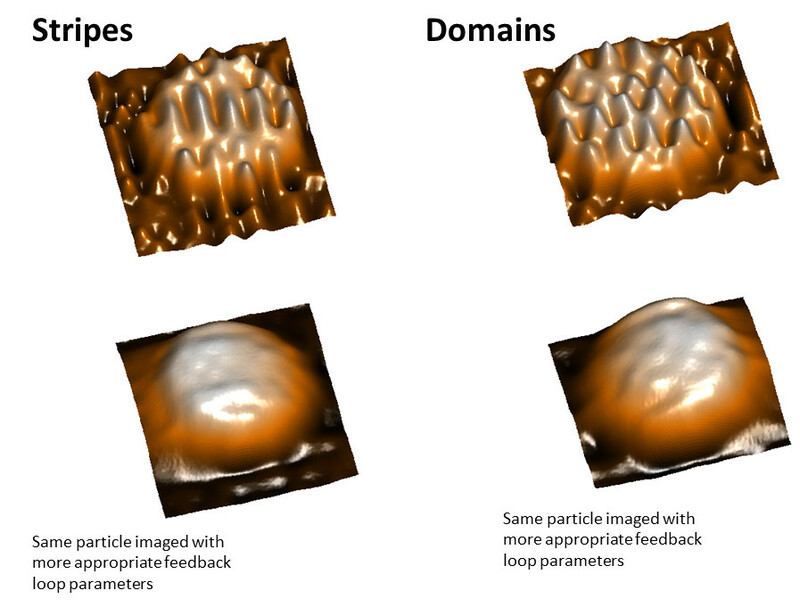 The AFM data in the Nature Materials paper are nowhere near to being “proof”. Phase imaging of heterogeneity at the (small) molecular level on non-flat surfaces is extremely difficult. There would need to be more images than that shown. The stripes are interesting, but occur only on one or two particles…they do seem to be digital zooms of larger images, since many of the “features” seem to be single pixel in size.The AFM data is basically hard to interpret and more data should have been got before publication. It is also rather confusing in its presentation, and I think it would have been more fair to show the data without the cartoons drawn on top of the data, or at least include this data in the SI. This is in contrast to the original STM data which as discussed previously (and as was pretty much proven by Predrag) is completely artifactual. Some other aspects of the STM evidence were discussed in minute details in a series of exchanges involving anonymous commentator Pep. Predrag Djuranovic, Philip Moriarty, Li Jinfeng, I, and others spent a considerable amount of time answering carefully the 20 or so comments that Pep left here over a period of a few days. Apects of that discussion were genuinely interesting and led for example to a refined understanding of the ‘projection argument’ (using a suggestion from a comment at Doug Natelson’s blog: positive post peer review in action! ), but, as Dmitry Baranov noted very early in the discussion (on Twitter) “@raphavisses and yeah, looks like Pep got more than just a quest for fairness there.” For this reason, I won’t attempt to summarize those long-winded arguments in this post (they can be found in particular under these two posts). It turned out that Pep was Pep Pàmies, Editor at Nature Materials, the journal which has published 4 of the stripy articles including the inaugural one (and which rejected a first version of Stripy Revisited; see my Letter to the Editors here). My comment identifying Pep is here as well as the robust discussion that followed; see also Ben Goldacre take on this episode, as well as Pep Pàmies note entitled “On my comments on Lévy’s blog“ [update 404: Pep has now removed the note from the web!]. Dave Fernig has responded to Pep Pàmies apologia for reuse of data on his blog and Philip Moriarty has provided a comprehensive response as a guest post. To claim the existence of stripes made of alkyl thiolate molecules based on a few dark spots in rather bad-quality TEM images…? Unheard of in the TEM community! The reference here is to really interesting paper, but it is not about stripes nor does it claim to show the existence of stripes, as I responded to Elias here. Funny thing is the TEM image from their appendix, Fig S2a, that is cited as independent confirmation is also an instrumental artifact. The ring of black dots is the out of focus point spread function (basically a Fresnel fringe). 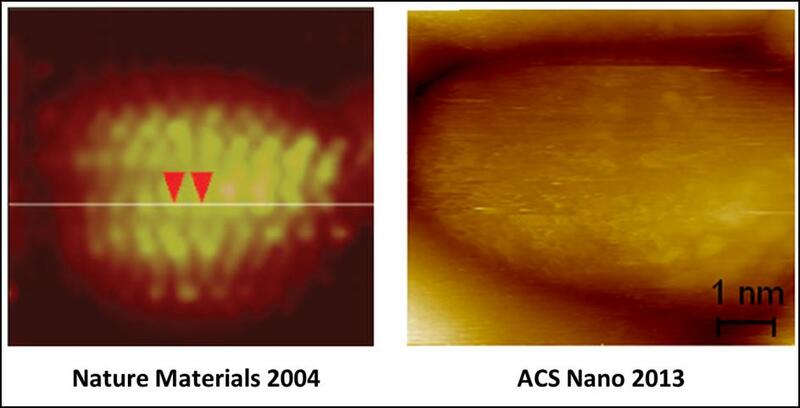 This is a very common problem for casual users of a TEM who are looking for core-shell nanoparticle structures. By changing focus, either a dark or bright ring can be created. Going in to focus will make it go away. The focus of the image can be determined from a quick FFT of the amorphous background, and sure enough, the passband is about a factor of two off from the optimal defocus. While the stripy controversy was about to become public, an article ‘confirming’ the existence of stripes by NMR was published in Nature Communications. No independent post publication peer review yet. Do you know an NMR expert who could comment on the Nature Communication paper? The invitation for a guest post is open.